Deputy Attorney General Rod Rosenstein's Confirmation Hearing Focuses On Russia Since Attorney General Jeff Sessions has recused himself from any possible investigation into the Trump campaign and Russia, Rod Rosenstein would have to pick up the task if confirmed. Rod Rosenstein's confirmation hearing to become deputy attorney general on Tuesday became much more about his superiors than his career. Rod Rosenstein, if appointed as deputy attorney general, could soon become the ultimate decider on the most politically sensitive subject in Washington. His confirmation hearing on Tuesday turned into a proxy war over the Trump administration's ties to Russia. Attorney General Jeff Sessions has recused himself from any investigation into the election and Russian officials, leaving the tough questions for his deputy. Rosenstein's three-hour hearing before the Senate Judiciary Committee focused less on his record as a 27-year Justice Department veteran and more on his superiors. "How can you investigate your boss?" asked Sen. Richard Blumenthal of Connecticut, pointing out that the attorney general could end up a witness in any investigation involving Russia. Blumenthal and other Democrats say there's only one way to guarantee public confidence in the Russia investigation — by naming an independent prosecutor to lead it. Rosenstein, who has a long history in cases involving public corruption and national security, refused to make that commitment. He said he doesn't have all the facts. "Senator, I don't know the details of what — if any — investigation is ongoing, but I can certainly assure you that if it's America against Russia, or America against any other country, I think everyone in this room knows which side I'm on," Rosenstein said. In a surprising turn, members of the committee spent some time clashing with each other — over the questioning of Sessions in January. Sessions clarified his testimony to the committee in writing on Monday, after the Washington Post reported he had given a misleading answer to Minnesota Sen. Al Franken. The three-page letter wasn't enough for Franken. "I think Sen. Sessions should come back. I think he owes it to the committee to come back and to explain himself," Franken said. That prompted the top Republican on the committee, Chairman Chuck Grassley, to jump in and defend Sessions. "I consider what Sen. Franken asked Sessions at that late moment — just as that story [had] come out — a gotcha question," he said. Later in the hearing, Franken said he couldn't have been nicer to the attorney general. Franken said Sessions had gotten himself into trouble by not mentioning he had two contacts with the Russian ambassador last year. "It can't be a gotcha question if he didn't answer the question," Franken said. "So the thing that got him was him saying he had not met with Russians, but that wasn't even my question." Franken had asked about what Sessions would do as attorney general if it came out that Trump campaign associates had connections with Russian officials — not whether Sessions himself had any contact. Sen. Dianne Feinstein, a Democrat from California, says she is worried about press reports suggesting the White House has been trying to interfere in ongoing investigations and court cases. "We need steel spines, not weak knees when it comes to political independence in the Department of Justice," she said. Can Trump's Pick For Attorney General Serve Independently From The White House? 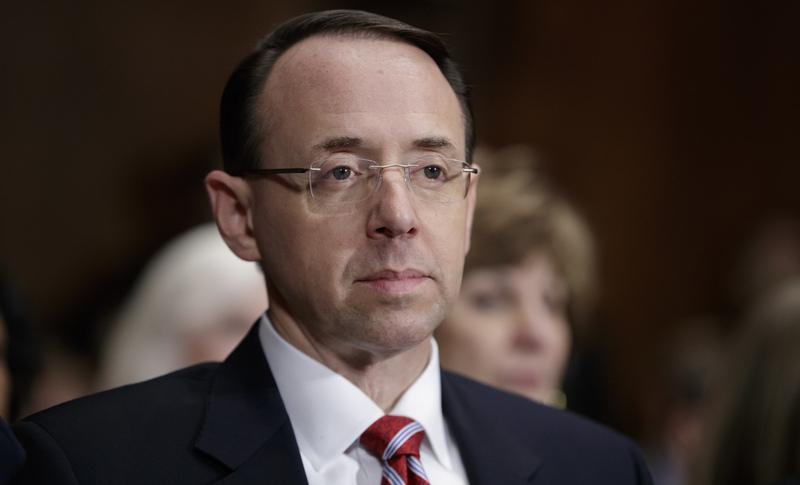 Rosenstein attested to his independence but declined invitations from Democrats to criticize the president's tweets. Last weekend, Trump claimed without evidence that President Obama had tapped his phones at Trump Tower. Rosenstein said he didn't know anything about the matter but said the president has First Amendment rights just like anyone else. Rosenstein also pledged to enforce rules that limit contacts between the White House and people inside the department on law enforcement cases.